Since 1996, we've been honored and humbled that you have made us the #1 rated and most recommended choice for smart, fast, and efficient no-nonsense FCC test prep. Our Five by Five software and apps will prepare you for ANY or ALL of the following FCC Amateur (Ham Radio) and Commercial Tests in the FASTEST TIME and with the MOST POLISHED USER EXPERIENCE of any product available, period. We also have FCC written test prep material in downloadable audio format for you to listen to in the car or on your personal audio device (iPod). We feature actual, up to date question banks, free lifetime updates, and 5000+ term dictionaries fully integrated into the product to help you really learn the material without losing your place. Sure, it's a little bit more expensive than those "free" sites - only if your time is not worth anything to you. Thousands of satisfied users have passed their tests in record time using Five by Five - we invite you to be next! Get it now for MS-Windows PCs, iPhone™ / iPad™, Android™, and/or MP3 Audio Format! Our Five by Five software and apps will prepare you for ANY or ALL of the above tests. 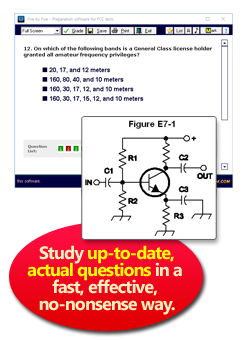 Prepares you for up to 11 different FCC/Ham Radio tests (3 amateur tests + 8 Commercial / Professional tests) using 100% ACTUAL and CURRENT FCC questions. What you study in the software is what you will see on the actual test. Get the software and apps below. Dauntless Software's Five by Five has been written to help hams and processionals to become familiar with the actual questions that will likely appear on their FCC tests and Ham Exams in the most efficient manner possible. By conscientious use of this program in preparation for the written test, it is very possible to score very highly on your test with a relative minimum of effort. Passed missing only a couple of questions. Had a day and a half instruction. I used the 5x5 training app. I am a believer now! Test was pretty easy. Questions were exactly the same as the 5x5 study questions, including the distractors. There is no grade, you get a proof of passing certificate. I'm sure I scored in the high 90s. I used your "Five by Five" program to study for the Amateur General Class element. I studied the program for about a week and a half before going to an exam session this morning. I completed the test in under 10 minutes scoring 100%. The examiners couldn't believe how fast I handed the answer sheet back to them and making a perfect score at the same time. Kudos to you for such a great program and the Extra Class ticket is next in my sights. This app is wonderful. I passed my test with flying colors--I am so glad that I found it. I would recommend it to anyone trying to get their GROL and it is a small price to pay for the work that has been put into this program. Keep up the great work you have done a wonderful job.Thank you so much! First to complete the exam in my test session, passed with 100% correct! with the help of your software ... I passed every test the FCC offers last year, with the exception of element 7 which now I will study for. I am quite proud of my accomplishment and could not have done it with out the aid of your program. I currently hold the amateur extra class, the GROL with Radar endorsement and the GMDSS radio maintainers license. Please feel free to use this in any product endorsements for your great software. I just wanted to let you know the results of my amateur radio Extra Class exam using 5x5 software to prepare. Passed the 50 question exam quickly and easily with only 1 wrong (couldn't tell which question I didn't get right, but it certainly was acceptable). Software was extremely helpful to test and prepare me for the exam. I received your Five by Five Preparation during the week. I studied for no more than two days. I aced my Technician exam this weekend. I am studying now for the General Exam...Keep up the good work! JWJ | "West Virginia's Finest"
I know it's been too long to thank you for such a great product. I used 5 by 5 to get my tech licence in January. And used it again to upgrade to my General in June. Only missing 3 questions. Thank you for such a great product will be using it again this winter for my extra. I will recommend it to all my friends! Again, thank you. I wanted to learn amateur radio in 1974 when I was 14 years old. I gave up learning morse code. I started studying again in 1987 and gave up again. Recently I heard morse code was no longer required. I was determined to complete it this time. Using your Five by Five testing program, my old books for reference and information from the internet (such as FCC Part 97), I aced the test (100%). I am extremely impressed with your program. By saving each completed practice test section, I was able to reload and review only the answers I got wrong instead of wasting time with questions I was already confident with and got right. Before I took the real test, I took the entire Five by Five Technician test over again. I was able to answer all 391 questions in a little over two hours. When I took the actual FCC test, I completed the 35 questions in about 7 minutes. It took me longer to fill out the forms than to take the test! Your test made me extremely confident and well prepared. I am studying for my General now and I hope to take it in about 6 weeks. Thanks for the great program, I wrote my GROL with Radar Endorsement, this program was well put together as after I finished with it, I walked away from all 3 exams in 30 minutes and aced the exams, it would be foolish to not use this inexpensive program. Thank You! I purchased 5x5 FCC ExamPrep when I still ran Windows XP up to running it on Linux today. In that time, I got my Extra and my children got their Extra, Extra, and Techs. This weekend, my wife passed her Technician test thanks to your program. Just wanted to let you know. Now she is studying for her General! Several weeks ago I downloaded and registered your 5X5 FCC test prep software. I used this software exclusively for three weeks and then wrote the element 4A radio exam. The test took ten minutes to complete. Great stuff! I used your program as my sole preparation for my Tech test and obviously passed with plenty of margin. This last Tuesday I decided to start studying for my General. Today, I took my general test and had only one question wrong. I credit 5by5 for my success. The next step is the Extra class test. There is no doubt I will do fine with 5by5. Thanks for making such a great software tool available! I passed the FCC General Radiotelephone Element 1 and Element 3 tests on the first try. I just passed the Amateur Extra exam with a perfect score (50/50) and the Five by Five software was definitely a major contributing factor. The software allowed me to cover each area of the exam quickly and methodically and pin point areas that needed more study. Overall this is a very good product. Things I liked: 1) Identifies specific questions missed - major improvement over prior version. 2) User interface is intuitive and layout works well - figures on same screen and questions. 3) Links to Internet and email from within software 4) Technical support was very responsive and effective. I just tested for the Technician and General Class ham licenses, and out of 70 questions total I missed only one. There's something to be said for each of the various study methods, but there's a whole lot to be said for Five by Five. I intend to test next month for Amateur Extra, and thanks to you folks, I'm not the least bit intimidated. I took my Tech test today and I couldn't believe that every question and answer looked very familiar. I was totally prepared for the test by using HamExam. I completed the test in a very few minutes, my confidence grew with each question that I saw because I had seen them all before! I missed two and both of those I knew the answer to but I got too confident and in too big of a hurry and misread the questions. Thanks HamExam! PS I am already studying for my General class. After three evening sessions of about 4 hours each, I took the with an ARRL VEC team in Las Vegas, NV. I scored 33/35. Your software is the most efficient way that I've ever used to study for an FCC exam. My only trouble was finding someone to thank. I purchased the program just a short month ago and yesterday I took the Technician exam in the afternoon and of the 35 questions I missed only two. There were about a dozen taking the exam. I finished first and it took me only 7 or 8 minutes. The examiners were surprised but elated that I did so well in so short a time. But that's what your program will do for anyone who stays focused. They have invited me to join the local club which I will be glad to do. I am so happy with myself. I wholeheartedly endorse your program. I'll let you know when I complete the "General". Your program got me here with ease. You have a wonderful program and I would tell anyone that this would be the way to go. I have such confidence that even the next day I am studying for the "General" class. Thanks fellows! I used your software for 8 days and breezed thru MROP EL1, GROL EL3 and scored a 90 on the Ship Radar endorsement EL8. The option of printing out only the correct answers is an awesome idea. Thank you making this software so affordable. I took my test for the General Class license Sunday. With the help of 5by5, the ARRL answer sheet and two months of study I was able to ace the test in 15 minutes. I answered all but one correctly. Thanks for the great software. I intend to use it for the Extra Class license, also. 100% correct on element 9 - Thanks! Want to say what a pleasure it was to use the [Five by Five] Ham FCC test preparation software.. I used it to pass the Technician - General - and yesterday the Extra. Without the help of this software I would not have had a chance obtaining any of these pass results.. A big thank you and may you continue to successfully create such clever so easy to use - wonderful software. I have successfully passed all the way up to extra class as of last night. used 5X5 all the way there. I could not have done it without your software! Well worth the asking price! I would just like to tell you your program is great. I bought it on November 06 2018 the day before the test. With only one day to study before the Ham test, I studied for an hour, and on November 07, 2018 I passed my first ever ham test for technician. I will continue to study for my general for the test next month. Once again thank you for making this great software. Just wanted to let your software was a great help in taking and passing the Amateur Extra exam this last weekend. Took the test recently, got 100%, thanks so much, studying for general now with five by five I am sure I will pass with no problems. Thanks again for a great program. Thank you guys so much, this software is outstanding, helped me to better my career. You guys rock. A week after I started studying with Five by Five, I took both the Technician and General exams. While I didn't get my numeric grades, the examiners said that I had done "very, very good" on both test. In retrospect I think I missed one question on the Tech test and probably aced the General. It took no longer than 20 minutes to complete both exams. I didn't encounter a single question on either exam that wasn't covered in some form on your practice test. I think the best use of your practice test was to identify areas where I needed more study. Once I had done that I could go online and research whatever information or concepts I lacked and use the information thus acquired to further my knowledge. 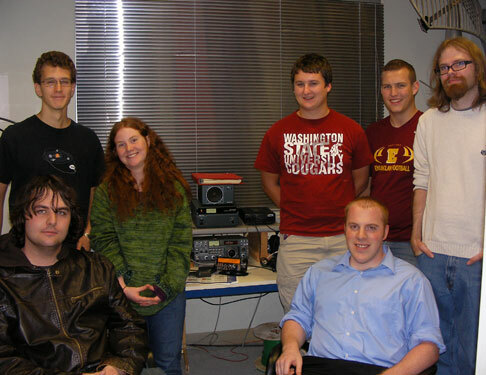 A hearty congratulations to our friends at the Washington State University Amateur Radio Club! The WSU cougars have used Five by Five to great effect in preparing their members for their Amateur exams. Thanks to JK to being kind in sending us this photo! I used your software and mp3s to study up for the grand trifecta. Yes, I�m a glutton for punishment so I decided to go from NO license straight to Extra Class. I spent a little over a month studying. I�m a professional driver so I listened to the mp3s while driving and studied for around 8 hours total at home each week, between software and reading/memorizing. 1st the Technician test� 15 minutes and aced it no problem. 2nd the General test� 25 minutes with 3-4 problem questions, but passed with flying colors. Then there�s the Extra test� 45 minutes of torture, 15-20 of my "problem questions", equations, circuit diagrams, the whole shebang! To make a long story short I walked away with my CSCE for Extra and am just waiting for the DCC ULS to show my very first call sign� and it�s going to be EXTRA! Out of 120 questions I got 103 right which is a 85.8% average between the three. The VEs were all impressed and one said it�s been quite some time since they�ve had somebody test out all three at once. Thank you for this software and especially for the mp3s, they REALLY helped me remember the material. Does this software / app work for US Coast Guard (USCG) GMDSS Exams? Yes! - Just prepare for either Maintainer or Operator, as required. The Coast Guard GMDSS exams are the same as the FCC ones. Just make sure when you purchase you select a package that includes the Commercial exams as the GMDSS exams are part of our FCC Commercial package. Will Five by Five prepare me for the GROL license that I need to be an avionics technician? It sure does. Having a GROL is an easy and useful add-on for any aviation mechanic. With a bit of study, in our experience and in the experience of many of our users, you could be ready for the GROL in under a day's sitting with Five by Five. Does Five by Five include all of the charts and figures I will need? Absolutely. Everything's included in the download. What's the difference between the Five by Five software / apps and the audio preparation? "Five by Five Audio" is our series of audio preps for the FCC commercial and amateur tests. The same basic material is covered in both the software/apps and the audio preps, though the software/apps have slightly more questions, as some questions with a large visual or calculative element are not included in the audio preps. The advantage of the audio preps is, for example, that you can burn the audio prep to a CD for listening to in the car or copy them to your iPod for listening elsewhere. ' Many users get both the software and the audio prep to help minimize their study time. The audio prep can be purchased instead of or together with the software/apps - there is on most platforms a discount for getting both, though to get this you must either purchase the software first and then the audio or both at the same time - there is no discount if you purchase the audio first and then decide to purchase the software later. To learn more about Five by Five audio, click here. In the PC version, you can print out the charts and figures. You can print out the questions. You can print out result sheets to show your friends. You can even print out lists of questions in a "book" form to study from when you're away from the computer. The iOS and Android versions allow you to read PDFs of the figures which you might be able to print out, though printing from those platforms is a bit nonstandard. Expensive? Compared to free web sites that offer a sloooooooooooooooooooooooooooooooooooooooooow HTML interface, perhaps. But Five by Five is very reasonably priced compared to all other books and software that we've seen. This software took hundreds of hours to write - your payment of our modest fees helps pay for things like programming tools and bandwidth, but you get in exchange a tool that is ideal for fast and efficient study - much more so than some website that only seems cheap until you start using it.. and the hours drain away.. ever so slowly.. because you can learn so many more questions in a short amount of time with Five by Five than any HTML-driven website. Our software and mobile apps are serious things - not amateur efforts. What you're getting there is an exceptionally polished user experience optimized to help you study and learn FAST. It pays for itself in saved time and frustrtation in no time. If we were out to make serious money, we'd be in a different line of business. We do this because we enjoy it. Hey, don't ask questions like this - just enjoy. No problem - simply start the order process online. At one point, you will get to a screen that asks you your payment method - you will have a choice there of paying by alternate means (non-credit card) and/or completing your order (telling the sensitive bits) by telephone. That said, please recognize that in over a decade of business we have had zero credit-card purchase related irregularities over our secure server, and this really should be the best way for most people to purchase the software. Five by Five is not intended to have direct explanations for each questions. Rather, it simply presents the questions in a convenient, highly customizable manner that has been designed to implant the correct answers in your brain. After using this program for a while, the correct answers will start to leap out at you so that in a great many cases you won't even have to read the questions. Actually, at one point, we considered making a version with explanations. This would be a LOT of work (as you might imagine - there are several thousand questions). To our great surprise, when we polled our existing users, the overwhelming consensus was that while explanations might be nice, not having them was just fine as those who wanted to really learn the stuff had supplementary material anyway, and for those who just wanted to learn the tests, what we offer is more than sufficient. That said, 5x5 also features an integrated "JargonBuster" dictionary. What this is a massive collection of over 5000 ham radio and commercial radio terms and definitions. When you encounter difficult terms in the app, it presents you the opportunity to see the definition without losing your place. In practice, the definitons provided amount to detailed explanations for a significant percentage of the quesions. The definitions feature is very neat. While it is quite new at the time of this writing, we're getting a ton of positive feedback from our users on this. Suffice it to say, none of our competitors have anything even remotely like this. Can I install the PC software on two machines? When you register the PC software, you get a personal license to it - this means that you can use it on more than one machine (say, your laptop and desktop) -- as long as it's for YOUR PERSONAL USE ONLY. Please don't let others use your unlocked codes or the software that has been unlocked in your name. We hope you find this arrangement fair. Don't fret - just let us know about it and we'll take care of it for a future edition. We're generally quite speedy about taking care of such things once somebody lets us know about them. If you have an issue with a particular question, Five by Five features a built-in question issue reporter so that you can let us know about it quickly and easily. In the "Classification" pane, you will see a web link. If you have an issue with a particular question, click as seen below to take you to the problem report page for that question - this will communicate with our back-end systems quickly so that the issue can be looked into ASAP. My registration key doesn't work / I've lost my registration code / I want to upgrade to the current version! Please visit our Unlock Help Wizard for assistance. .
Is this Software available on CD-ROM? Unfortunately, no. Not at this time and it is unlikely to be in the future. Just some guys who like Ham Radio and Airplanes. We're scattered throughout the USA. We've been making this software and keeping it up to date since 1996. Visit our helpdesk, and go from there. This is good for technical support, pre sales questions, and anything else you can think of! What happens when new test pools come out? If history is any guide (and it usually is), we'll update the Five by Five soon-after. Software upgrades are always free to registered users. We have provided the latest official available test pools to our users within a week of their release, and usually considerably sooner, with every change to FCC Commercial and Amateur Radio tests from 1998 to today. During periods when a test changeover is coming to a new test bank, we generally keep both the current and imminent test banks active in our products at the same time so that users can choose what to study based on their test dates. We work hard to keep the software up to date so you have peace of mind! Tell me more about the tests. Five by Five will help you prepare for your FCC Amateur and Commercial written exams in the quickest and most painless way possible. Many people are able to be ready for their tests in only an evening or two of study with our software. The software itself should be rather straightforward to use - simply select the test you're interested in studying for, select the chapters you want to concentrate on, and then select your study or learning mode. There are numerous options that allow you to customize the study, learning, and testing features to suit your best. These should more or less be self-explanatory, but you can also click on the little question mark buttons throughout the software for help with specific items. We have occasionally been asked "what is the best or recommended method to use to learn the material quickly?" There really is no such thing - while we do provide a series of "quick settings" buttons on the test options screen that progress from learning the material through various training modes and finally through simulated exam modes. This can be a reasonable way of studying, but it's just one of many - there is no "right"or "best" way. Please experiment so that you find a mode that works for you! Yes! this software is 100% what you need to take and pass your FCC written tests (also known as "written elements"). You do not need additional materials to study for and to pass your FCC amateur and/or commercial written tests. This software has helped hundreds of people and will work great for you. The questions provided by Five by Five are ACTUAL FCC QUESTIONS. They are regularly updated by our editorial staff. To make sure that you have the latest available version of the software and its data, click on 'Program Updates Check' from the main menu and use the built-in self-update tool. It is recommended that you do this regularly - while the questions don't tend to change too often, it never hurts to be sure. This software features LIFETIME FREE UPDATES to registered users in good standing. What this means is that, for example, if you are planning on doing your Amateur (Ham Radio) exams now, you can take the Technician exam now, and when you're ready for the General or Extra, simply use the built-in self-update and study as you need to. The software is ready for you! If you need help with our software, please visit our online helpdesk. Notice: much of the information taken below is taken directly from the FCC. However, this information is potentially subject to change without notice. Please visit the FCC's website for canonical information. Should you find deficiencies or out of date information in this document, please let us know via our helpdesk Thank you. The amateur and amateur-satellite services are for qualified persons of any age who are interested in radio technique solely with a personal aim and without pecuniary interest. These services present an opportunity for self-training, intercommunication, and technical investigations. Twenty-seven small frequency bands throughout the spectrum are allocated to this service internationally. Some 1,300 digital, analog, pulse, and spread-spectrum emission types may be transmitted. Millions of amateur operators in all areas of the world communicate with each other directly or through ad hoc relay systems and amateur-satellites. They exchange messages by voice, telephoning, telegraphy, facsimile, and television. In areas where the FCC regulates the services, an amateur operator must have an FCC or Canadian license. FCC-issued Reciprocal Permit for Alien Amateur Licensee are no longer needed. Reciprocal operation in the U.S. is now authorized by Section 47 C.F.R. ?? 97.107. All frequencies are shared. No frequency is assigned for the exclusive use of any amateur station. Station control operators cooperate in selecting transmitting channels to make the most effective use of the frequencies. They design, construct, modify, and repair their stations. The FCC equipment authorization program does not generally apply to amateur station transmitters. The current classes are: Technician, General, and Extra (also known as "Amateur Extra". Technician Class: The privileges of a Technician Class operator license include operating an amateur station that may transmit on channels in any of 17 frequency bands above 50 MHz with up to 1,500 watts of power. To pass the Technician Class examination, at least 26 questions from a 35 question written examination must be answered correctly. Technician Class licensees also have privileges in four amateur service bands in the HF range (3-30 MHz) (Refer to Section 97.301(e)). General Class: The General Class operator license authorizes privileges in all 27 amateur service bands. Upon accreditation by a Volunteer-Examiner Coordinator (VEC), an individual can help administer certain examinations. In addition to the above written examination, the requirement for a General Class operator license includes a 35 question written examination for which 26 correctly answered questions is the minimum passing score. 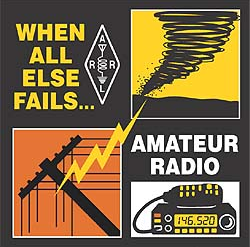 Amateur Extra: The privileges of an Amateur Extra Class operator license include additional spectrum in the HF bands. In addition to the two above written examinations, the requirement for an Amateur Extra Class operator license includes answering correctly at least 37 questions on a 50 question written examination. Additionally there are a few grandfathered (still valid, but not offered to new licensees) classes. Operation of an amateur station requires an amateur operator license grant from the FCC. Before receiving a license grant, you must pass an examination administered by a team of volunteer examiners (VEs). The VEs determine the license operator class for which you are qualified through the testing of your skills and abilities in operating an amateur station. You can contact a VE team in your community to make arrangements for being administered the examination elements you desire. If you need assistance in finding a VE team in your area, contact a Volunteer Examiner Coordinator (VEC). After you successfully complete the exam, the VEC collects your Form 605 document from your VE team and, after carefully screening it, forwards the information thereon to the FCC for processing, usually electronically. The VEC may also handle registering an examinee with the FCC. Your operating authority begins when your license grant information appears on the amateur service licensee database of the Universal Licensing System. International treaty requirements for Morse Code exams for Amateur Radio licenses using frequencies below 30MHz were have been nullified. Countries including the US have been reviewing and revising their regulations and are now free to remove all Morse Code requirements. "No-code" licenses which did not require any Morse Code examinations were available only for the Technician Class license from 1991 to 2007, and limited those licensees only to operation above 30MHz. That was most of what modern Hams wanted... use of handheld and mobile radios, Amateur Radio satellites, packet radio and most modern/digital modes. As of February 23, 2007, Morse Code examinations are no longer required by the FCC. All three license classes, Technician, General and Extra, can be attained by written exams alone and have their HF privileges. The frequencies available to each class of license have not changed. In short - YOU DO NOT NEED TO KNOW MORSE CODE FOR ANY HAM RADIO LICENSE. VECs coordinate the efforts of Volunteer Examiners (VEs) in preparing and administering amateur service operator license examinations. The coordinating VEC screens collected information, resolves all discrepancies, and forwards all required data to the FCC electronically. All VECs are authorized to coordinate examination sessions at any location an examination can be administered. A VEC, however, may choose to limit its area of operation to a particular geographical area. An FCC-accredited Volunteer Examiner Coordinator (VEC) organization will hold the local exams which you will take to get your license. These exams occur in most metropolitan areas and many rural locations across the US. They are only held at pre-announced times and locations. To find the nearest VEC, please visit the FCC list of VEC organizations. The fees for the exams payable to the VECs are usually modest - as of 2008 generally less than $15 per exam. The answer depends on whether you wish to operate or repair and maintain radio stations. If you only intend to operate a radio station, read the Radio Operations paragraphs below. If you intend to operate, repair, and maintain radio stations, read the Radio Maintenance and Repair paragraphs below. CAUTION: These listings only describe when a commercial operator license is necessary. A commercial operator license does not constitute or imply FCC authorization to transmit radio signals. Before you operate any radio station, make certain that the station is licensed as required by the FCC. Citizens band and Radio Control radio stations do not require individual station licenses. Who Needs a Commercial License for Radio Operations? the ship is larger than 300 gross tons and is required to carry a radio station for safety purposes. Coast stations which operate on medium or high frequencies, or operate with more than 1,500 watts of peak envelope power. Aircraft radio stations, except those that use only VHF frequencies on domestic flights. International fixed public radiotelephone and radiotelegraph stations. Coast and ship stations transmitting radiotelegraphy. Coast stations operating on VHF frequencies with 250 watts or less of carrier power. Ship stations operating only on VHF frequencies while sailing on domestic voyages (unless the vessel carries more than six passengers for hire, or the ship is larger than 300 gross tons and is required to carry a radio station for safety purposes). Aircraft stations which operate only on VHF frequencies and do not make foreign flights. Who Needs a Commercial License for Radio Maintenance and Repair? All ship radio and radar stations. All hand carried units used to communicate with ships and coast stations on marine frequencies. All aircraft stations and aeronautical ground stations including hand-carried portable units) used to communicate with aircraft. Two-way land mobile radio equipment, such as that used by police and fire departments, taxicabs and truckers, businesses and industries, ambulances and rescue squads, local, state, and federal government agencies. Personal radio equipment used in the Citizens Band, Radio Control, and General Mobile Radio Services (GMRS). Auxiliary broadcast stations, such as remote pickup stations. Domestic public fixed and mobile radio systems, such as mobile telephone systems, cellular systems, rural radio systems, point-to-point microwave systems, multipoint distribution systems, etc. Stations that operate in the Cable Television Relay Service. Satellite stations, both uplink and downlink of all types. NOTE: Possession of a commercial radio operator license or permit does not authorize an individual to operate amateur or GMRS radio stations. Only a person holding an amateur or GMRS radio operator license may operate an amateur or GMRS radio station. Examinations - WHICH TEST(S) DO I NEED TO STUDY FOR? To obtain an FCC Commercial Operator License, applicants must submit, to the Commission, proof of passing written and/or telegraphy Elements as illustrated in the table. Written Examination Elements - Yes! Five by Five can help you prepare for any or all of the following written examination elements. Element 1: Basic radio law and operating practice with which every maritime radio operator should be familiar. To pass, an examinee must correctly answer at least 18 out of 24 questions. Element 5: Radiotelegraph Operating Procedure. Radio operating procedures and practices generally followed or required in communicating by means of radiotelegraph stations. To pass, an examinee must correctly answer at least 38 out of 50 questions. * Note that this test has been depreciated (is basically no longer given or used). What content the FCC deems still relevant has been incorporated into the Element 6 test (or elsewhere). Our element 6 test and banks are complete and include the so migrated content. It is likely that you will not have to take the Element 5 test. However, we continue to include this in the package for practice, historical, and/or personal interest reasons. Element 6: Advanced Radiotelegraph. Technical, legal, and other matters applicable to the operation of all classes of radiotelegraph stations. To pass, an examinee must correctly answer at least 75 out of 100 questions. Element 7: GMDSS Radio Operating Practices. GMDSS radio operating procedures and practices sufficient to show detailed practical knowledge of the operation of all GMDSS sub-systems and equipment. The exam consists of questions from the following categories: general information, narrow band direct printing, INMARSAT, NAVTEX, digital selective calling, and survival craft. To pass, an examinee must correctly answer at least at least 75 out of 100 questions. Element 7R: Restricted GMDSS radio operating practices. Fifty questions concerning those GMDSS radio operating procedures and practices that are applicable to ship stations on vessels that sail exclusively in sea area A1, as defined in sections 80.1069 and 80.1081 of the Commission's Rules. To pass, an examinee must correctly answer at least 38 out of 50 questions. Element 8: Ship Radar Techniques. Specialized theory and practice applicable to the proper installation, servicing, and maintenance of ship radar equipment in general use for marine navigation purposes. To pass, an examinee must correctly answer at least 38 out of 50 questions. Element 9: GMDSS Radio Maintenance Practices and Procedures. Requirements set forth in IMO assembly on Training for Radio Personnel (GMDSS), Annex 5 and IMO Assembly on Radio Maintenance Guidelines for the Global Maritime Distress and Safety System related to Sea Areas A3 and A4. The exam consists of questions from the following categories: radio system theory, amplifiers, power sources, troubleshooting, digital theory, and GMDSS equipment and regulations. To pass, an examinee must correctly answer at least 38 out of 50 questions. Telegraphy Examinations Elements - Note: Five by Five does NOT prepare you for these typography elements. However, our PilotMorse software can help to prepare for these. Element 1 - 16 code groups per minute. Element 2 - 20 code groups per minute. Element 3 - 20 code groups per minute. For speficic information regarding Telegraphy exams, please visit the relevant FCC home page. We also suggest thatyou look up Title 47, Part 13.. Submit FCC Form 605 and FCC Form 159 (fee processing form) along with the appropriate Proof of Passing Certificates (for the requisite written and/or telegraphy examination elements) to apply for any commercial operator license, with the exception that endorsement examinations do not require the filing of the Form 159 or any fees. Also, Restricted Radiotelephone Operator permits have no proof of passing certificate requirement. Use the FCC Form 605 and the FCC Form 159 to renew your license or to replace a lost, stolen, or mutilated license. Many Commercial Operator License Examination (COLE) Managers file these documents for applicants who test with them. Ask your COLE Manager if they provide this service to their customers. The FCC currently issues the following types of radio operator licenses and endorsements: To learn more about them, click on the links (links open in a new window). If these links go dead / don't work, you can find the same information starting at the FCC's homepage.